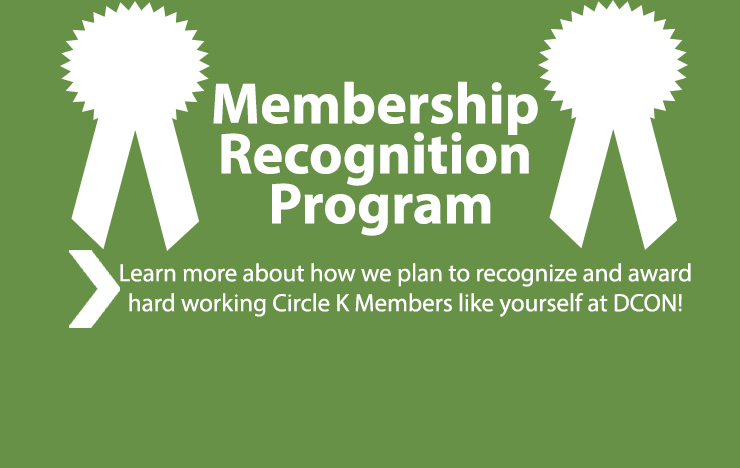 The Membership Recognition Program is a program released by the Awards committee designed to reward and recognize YOU for your hard work in Circle K. We are releasing the information and requirements to receive an award now, so that you understand what our expectations are and have time to plan your goals for your service year. Below you will see a table (downloadable as a PDF) that includes a comprehensive checklist that lists the minimum requirements for each specific tier. There are three tiers to this program: Bronze, Silver, and Gold. Based on your service hours and the events you attend, you can earn recognition at this year’s DCON. Please share this information with your clubs! How does this program work, how do I apply? 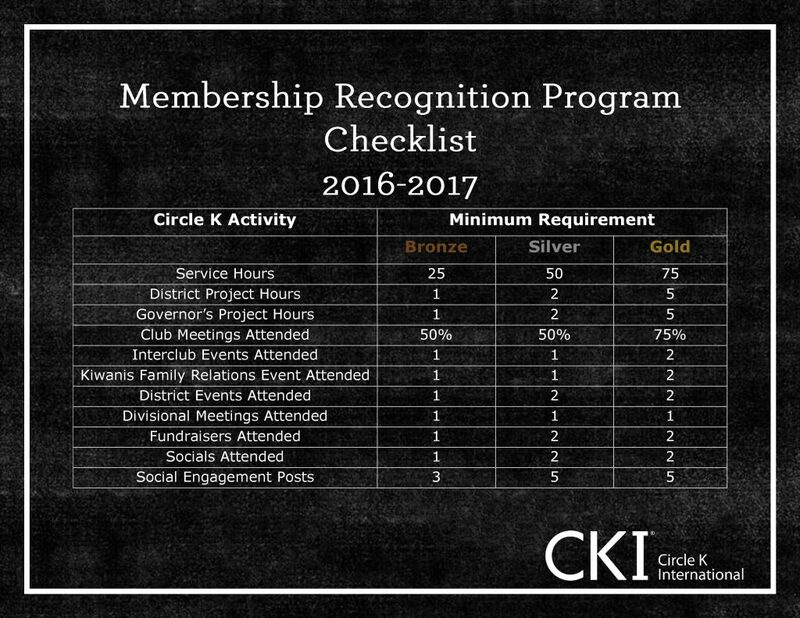 When Award applications roll out the beginning of 2017, there will be an application for the Membership Recognition Program. You can enter your numbers and answers through the application. Take a look at the checklist. Aim for a tier and understand the requirements. Make sure that there is some kind of proof of your work. (i.e. telling your secretary your hours or screenshotting social media posts). Wait till Award applications come out and fill in your numbers/ answers accordingly! Anyone that is a dues paying member is eligible to apply! Do my District and Governor’s Project hours count towards my total Service hours? What is an interclub event? An event that includes at least two different Circle K clubs and at least two members from each club. What is a Kiwanis Family Relations (KFR) event? An event that includes at least one Circle K club and one club from a branch from the Kiwanis family (Key Club, Kiwanis). The event should have at least two members from each club. What counts as a District Event? DCON 2016, DLSSP 2016, and New York Speaking 2016 are the only three district events that will fulfill the requirement. What counts as a “Social Engagement”? Changing your Facebook profile/ cover photo. Sharing an event on Facebook. Writing an article for a newsletter. Social engagement is not limited to this list. If you think you might be doing something that qualifies, include it in your application. Make sure you screenshot your posts to include in the application! What if I cannot meet a requirement? For example, I do not have the time or money to attend District Events. I don’t think it’s fair for me to not qualify because of that. This checklist is by all means NOT the law of what determines dedication. It is a good indicator using quantitative measures, and that makes it easier for the District to grade and assign awards. But there are other ways to determine this as well. When the application opens, there will most likely be an essay component. The essay component will be optional, but it will give you a chance to show what Circle K means to you and also explain your circumstances for not fulfilling certain criteria. In the case where one or two requirements cannot be met, answering the essay question along with an explanation is an adequate substitution. This program is not meant to penalize or make things difficult for anyone. If you are a devoted member, you deserve recognition. If you have any further questions, feel free to email awards@nycirclek.org for answers and clarification!